Selected by Scott Secco - Bruno Long just posted this gem and to me it really speaks to how fun summer riding is... plus I'm a sucker for backlit dust. And it doesn't hurt that it features two of the fastest female downhillers in Canada. Look for another fantastic photo essay from Bruno in the not-too-distant future. 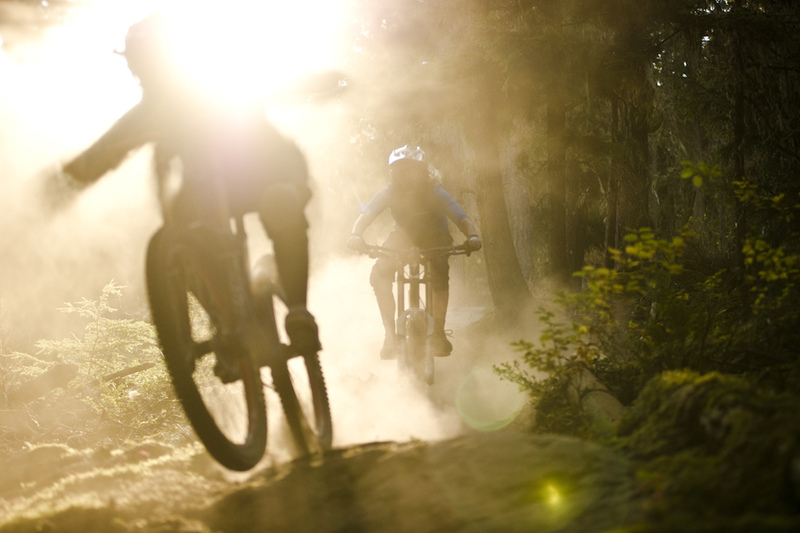 Nothing like chasing your buddies down a trail at the end of a dusty days riding! what is this dust you speak of? we have tons. you guys can all come share some. The sunlight blurring the lines of the first rider as well as the depth of field gives it the realistic touch of that dusty late afternoon looking into the sun at the riders. I like the photo a lot more than I like the amount of dust in your eyes & teeth chasing someone down a trail that time of year. Well done Bruno. I didn't think much of this pic at first but it has grown on me. It has a realism that I really dig. The point of focus is the back rider. f 2.8 just gives it a shallow depth of field. Awesome shot!! !